Sail out of Miami on the ultramodern MSC Divina for a 7 night Western Caribbean cruise, Dec 2-9. An interior Stateroom on the MSC Divina through Vacationwiser.com®, costs as low as $54 bi-weekly for two people based on double occupancy. The MSC Divina provides excellent entertainment options and fun that lasts late into the night. If you're looking for a luxurious cruise, the MSC Divina's nod to the 1960 Italian comedy-drama film, La Dolce Vita, says it all: the sweet life! 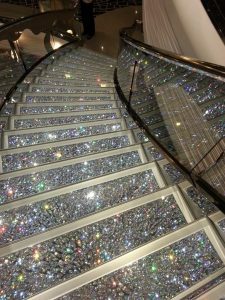 The atrium's two-story staircase dazzles with thousands of Swarovski crystals. Discover exotic Caribbean destinations. The MSC Divina offers unique port-of-call destinations that you can't experience with other MSC Cruises. Make a Booking on any MSC Cruise for two people between February 1 and February 15 to receive a bottle of sparkling wine and a tray of chocolate covered strawberries in the room - can take place any time. Have you been dreaming about going on a cruise but don't think you have the means to do so? Vacationwiser® empowers you to make vacation purchases in a financially responsible way. 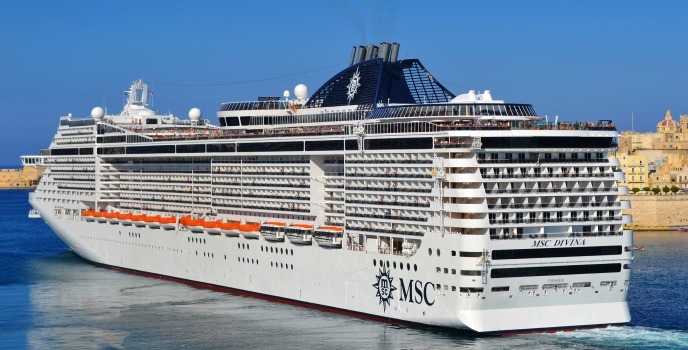 This MSC dream cruise is more affordable than you think with. Vacationwiser® offers easy payment options via payroll deduction and 12 months' interest free, or use the option to save in advance with our travel savings plan. With our travel savings plan, you can begin paying towards your credit approval. The amount you pay can be combined with your credit approval to allow you to purchase a larger vacation or it can be deducted from the cost of the trip so that your balance is less. Call us at 800-358-2883 to inquire more about our travel savings plan. Work can be draining, whether it's stressful or perhaps, just monotonous...We all need an escape from our daily routine. Feel guilty taking time off? Don't! According to the Society for Human Resource Management, "When employees do not use their PTO, it affects their happiness, health, performance, and productivity, all of which can undermine company success." Statistically, 51% of employees who take vacations are more productive, so cruise-away! So why settle for a staycation when you can cruise affordably? This is a limited time offer so call us today to book your MSC Cruise 800-358-2883 and get ready to sail into the sunset!